Do you have an under the stairs closet in your home that’s become a catch-all for storing random items? 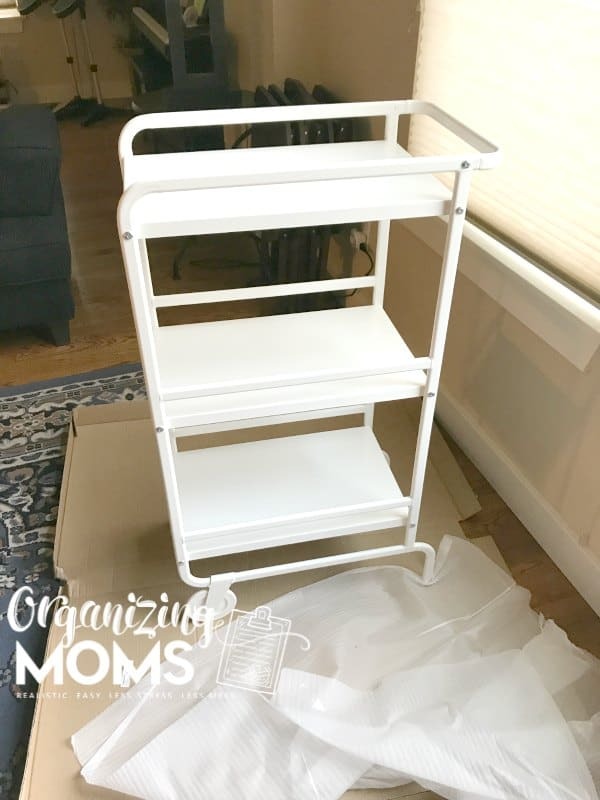 Maybe you have a little area that you just know would be great for storage, but you can’t figure out how to make it usable? We have a space like that under our staircase. It’s a little closet with a small door, and it has a lot of floor space. The only problem is, it doesn’t have a lot of height to it, and I’m six feet tall! Because it’s right next to our kitchen, I thought it would be perfect for holding extra kitchen things like crockpots, bread makers, etc. The only problem was, the closet also seemed like a good place to store a lot of other random things too. Is there some kind of organizing principle that says undesignated storage spaces with always be filled up before you can figure out a good system for using them? 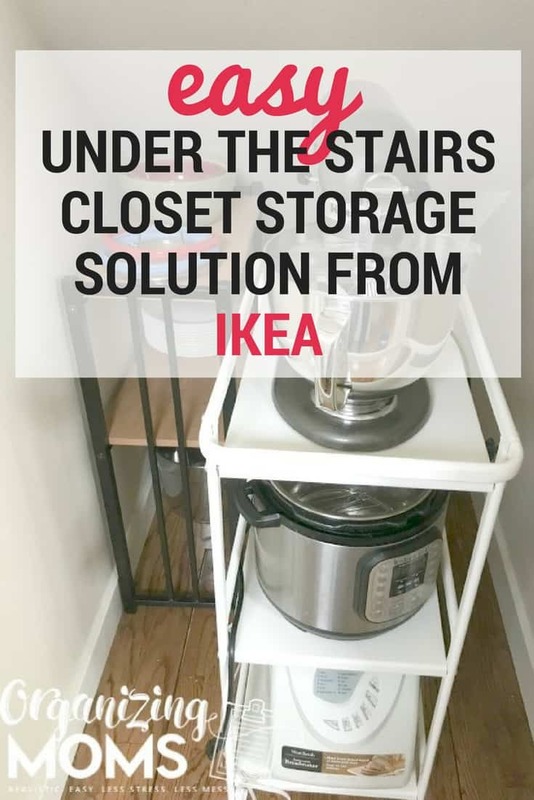 I had thought if I could just find a cart to put in the closet, I could pull it out and get what we needed without risking another blow to the head. But first, I had to figure out what to do with all of the stuff we had shoved into this little closet. 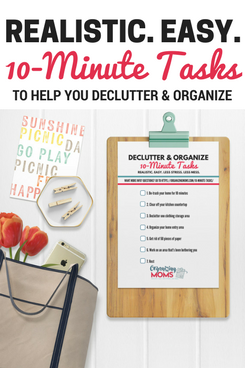 I worked in 10-minute sessions and took breaks while I decluttered. 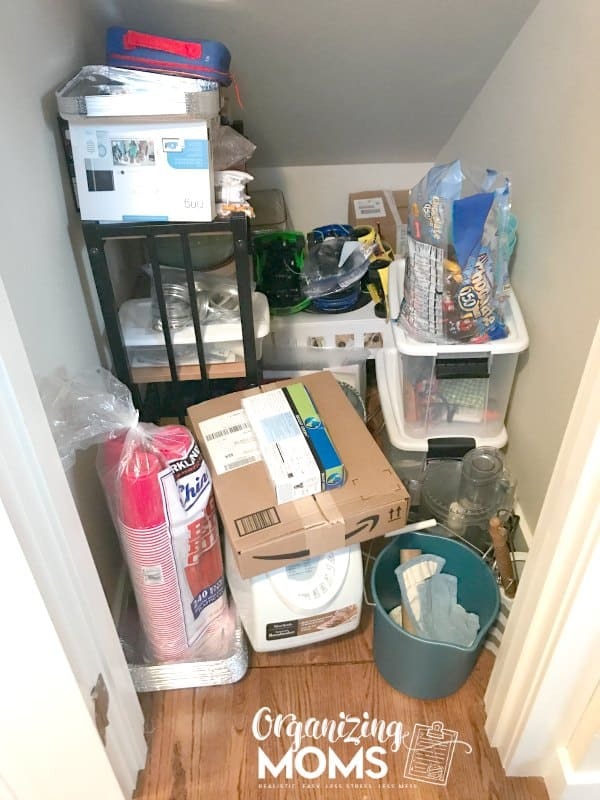 I’ll be honest, I had been putting off this project forever because I was pretty sure I wouldn’t be able to find a good place to store all of the stuff in this closet! To my surprise, it wasn’t as bad as I thought it would be! Most of the stuff we put in the closet belonged in the garage, so that’s where it went. I put a few things in the donate pile, and I’m saving a couple of things for my cousin…if she wants them! 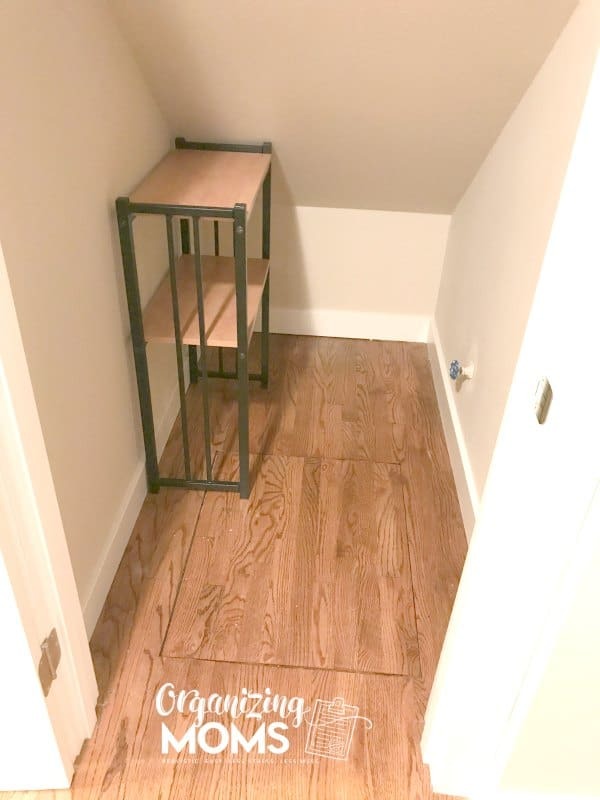 It was so nice to see the floor in this closet again! 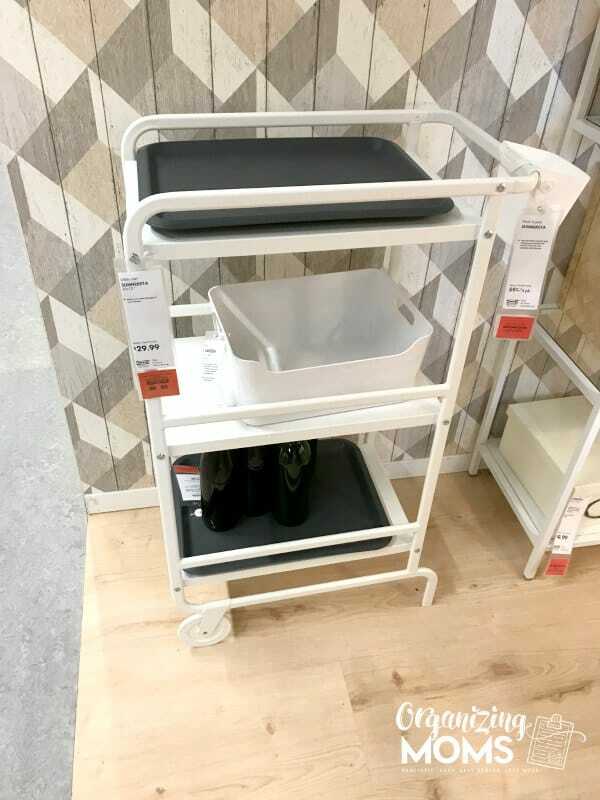 When we took our trip to IKEA, I bought a Sunnersta cart for $29.99. 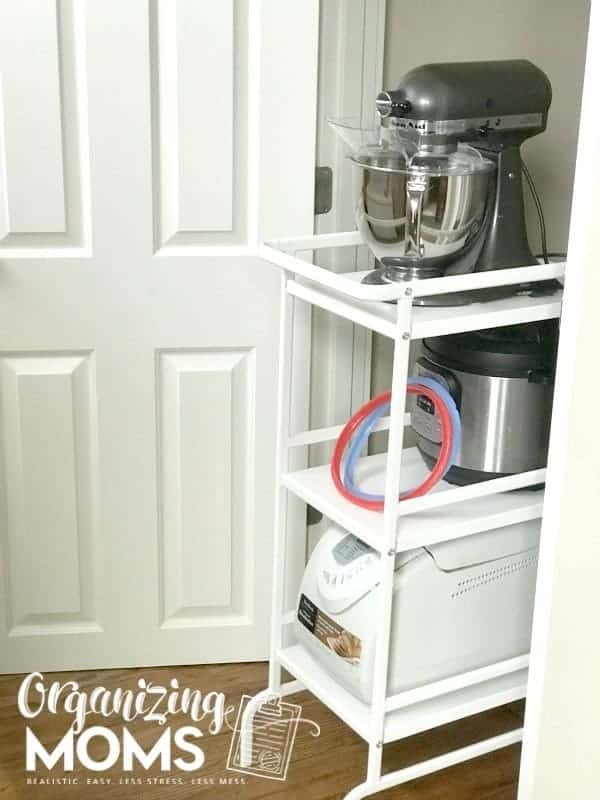 It is narrow enough to fit through the little closet door, and the perfect size to hold my mixer, Instant Pot, and bread maker. BONUS – it was easy for me to put together by myself. Here’s another inexpensive option on Amazon. I kept our little shelf in the closet too. It’s perfect for storing extra dishes. I decided to put some extra water and emergency supplies in the back of the closet where there’s a really low ceiling. Clearing out this space and using the cart has made our awkward little closet much more functional. 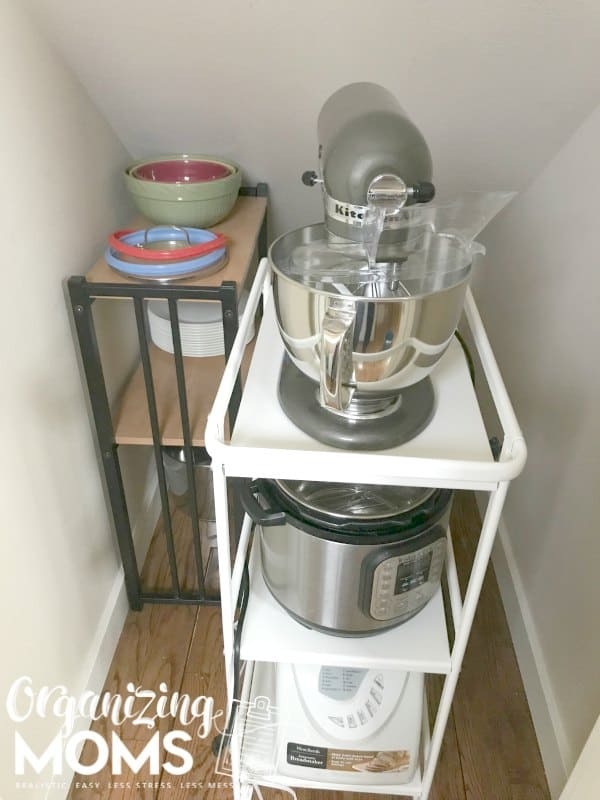 I love that I’m not using cabinet and counter space to store our appliances, and by using the cart, everything is much easier to get to! Decide what you want to use it for. Knowing exactly what you want to store in the space makes planning much easier. 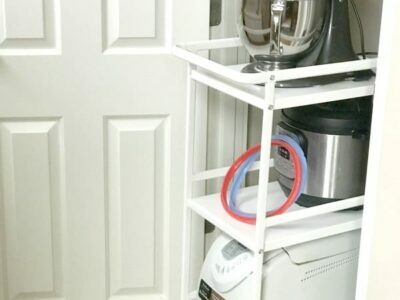 Brainstorm storage ideas that will make the space easier to access. Carts on wheels, drawers, or bins make the space more functional. Fill the space with the items you need to store. Use it for a few weeks, and tweak your system as needed. What awkward spaces would you like to organize in your home? Tell us about it in the comments! WANT TO REMEMBER THIS? 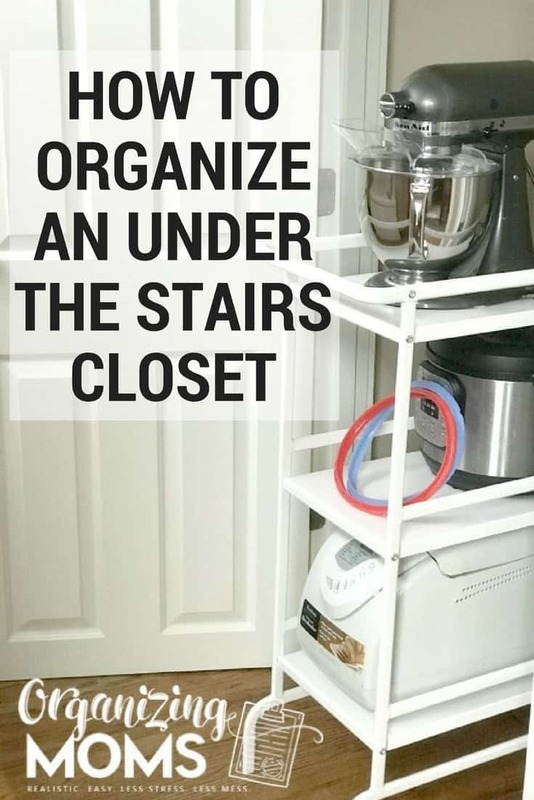 SAVE HOW TO ORGANIZE AN UNDER THE STAIRS CLOSET TO YOUR FAVORITE PINTEREST BOARD.